Beat all ingredients except powdered sugar in medium bowl with electric mixer on medium speed until smooth. Pour batter into plastic squeeze bottle with narrow opening. Heat 8-inch skillet over medium heat until hot; grease lightly. Working quickly, squeeze batter to form 4 straight, thin lines that intersect at a common center point to form a star shape. 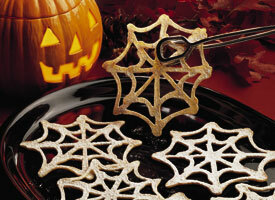 To form cobweb, squeeze thin streams of batter to connect lines. Cook 30 to 60 seconds or until bottom is golden brown; carefully turn. Cook until golden brown; remove from skillet. Cool on wire rack. Heat oven to 325 F. Bake cookies on ungreased cookie sheet 5 to 7 minutes or until almost crisp (cookies will become crisp as they cool). Remove from cookie sheet; cool. Sprinkle with powdered sugar. Store cookies in container with loose-fitting cover. If you don't have a squeeze bottle at home to use, you can pick up a plastic picnic-style bottle for ketchup at your grocery or discount store. Display your cookies and assorted candies on a tray on a Halloween-decorated table. Draw a large spider to stand guard over your treats! Source: Gold Medal Flour, a Reg. TM of General Mills, Inc.